Utah is the site of a wealth of Native American history although you'll find their history all over North America. With Utah as our neighboring state, we as photographers find it difficult to stay away and not explore the red rock canyons. Although I suspect there are few places that have not been explored already, the remoteness of many sites feeds into the feeling that no one has been here before. Comb Ridge is one of those places. 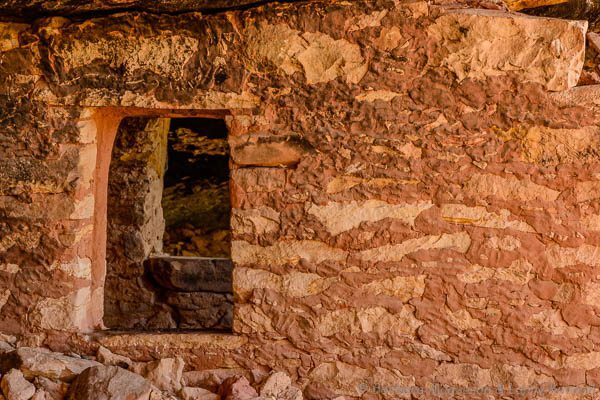 You could spend a lifetime here and miss ruins and rock art tucked away at the end of narrow canyons, on top of ridges and, on rock walls high above the valley floor or canyon drainages. This photograph is of one of the Fish Mouth Cave ruin walls in detail. Notice the fingerprints still visible in the clay mortar between the stones. This entry was posted on Thursday, August 3rd, 2017 at 12:54 am. 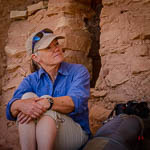 It is filed under Collections, Travel and tagged with Anasazi, anthropology, Archaeology, BLM, Bureau of Land Management lands, canyons, Cedar Mesa, cliffs, Comb Ridge, culture, desert, fingerprints in mud plaster, Fish Mouth Cave, high desert, History, Native American, nature, public lands, red rock country, ruins, San Juan Basketmaker style, scenics, travel, Utah. You can follow any responses to this entry through the RSS 2.0 feed.